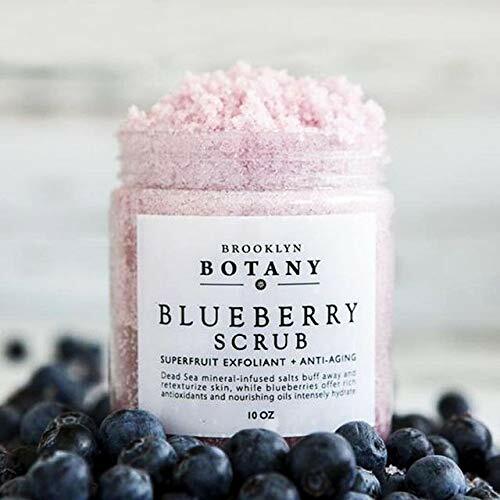 GET YOUR GLOW ON: Our Exfoliating Blueberry Body Scrub has an invigorating mix of sea salt and skin-loving nourishing oils to leave your body looking and feeling younger, fresher, and more glowing than ever before. As you gently buff away dead, dry skin, newer-looking skin underneath is revealed. 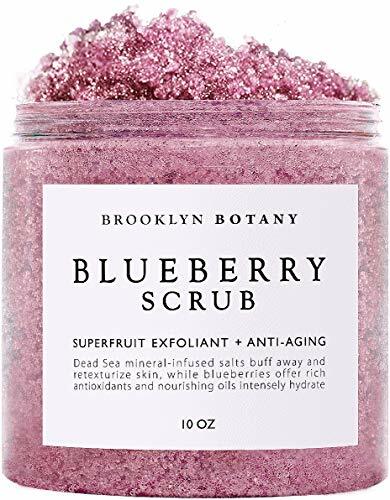 Combine this with the scrub’s intoxicating berry scent and you’ll look and smell like you’ve just emerged from a day at the spa! SPIDER VEINS TREATMENT & STRETCH MARKS: If you suffer from annoying broken capillaries, commonly known as spider veins, then this scrub will be your new best friend. Blueberries are great for your circulatory system as they’re able to keep blood vessels and capillaries flexible, making them less likely to break. and also help prevent any future spider veins from forming. 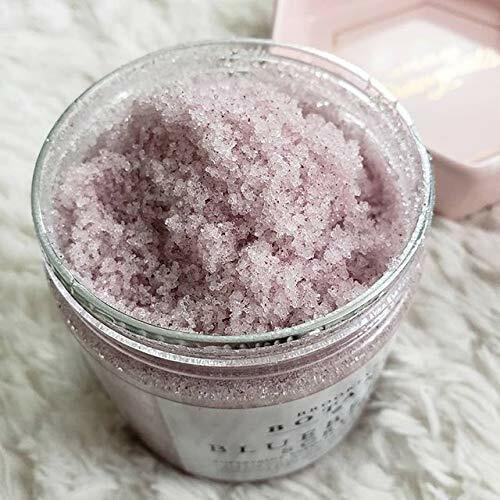 You can also erase stubborn stretch marks thanks to the Vitamin E abundant in the rich grapeseed oil present in this scrub. TURN BACK THE HANDS OF TIME: Our Body Scrub is packed with skin-healing blueberries that will combat the free radicals in your skin that are responsible for signs of aging, such as dark spots, fine lines and wrinkles, thanks to their high levels of Vitamin C. Our proprietary scrub formula may seem drier than other scrubs, but after using, it will leave your skin exfoliated and extremely moisturized. 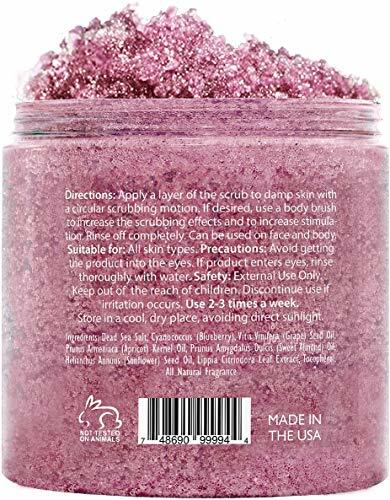 WAVE FAREWELL TO BLEMISHES: If you have oily, blemished skin, you’ll love this scrub. You can say goodbye to pimples and future flare-ups thanks to the wide range of vitamins and minerals in blueberries that have been proven to help restore hormone balance, which in turn counteracts skin problems. 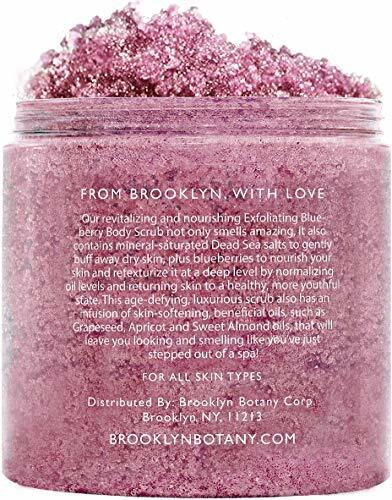 STAY MOISTURIZED: Our Exfoliating Blueberry Body Scrub is equally perfect for dry skin, thanks to the inclusion of rich, precious oils such as apricot oil and grapeseed oil that will leave your skin feeling nourished and baby-soft for hours!